I arose early this morning and caught a Ryanair flight from Dublin to Seville, and I am here for the next few days on a city break, having arrived late this afternoon [23 October 2018]. 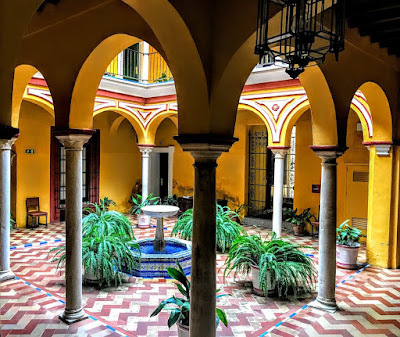 I am staying in the Hotel Las Casas de la Judería de Sevilla, an unusual hotel complex made up of 27 traditional houses, where the 134 different rooms are linked through 40 patios, courtyards, gardens and a labyrinth of small passageways, balconies and Roman-style tunnels. The hotel takes its name from its location in the heart of the old Jewish quarter of Seville, just minutes away from the main landmarks in the city. Houses continue to be added to this intriguing hotel, and it is a pleasure and a surprise to be lost by the fountains, in the vegetation of the courtyards as I wander through this maze. This interesting location is an invitation to spend time over the next few days exploring the Jewish quarter on my doorstep, and to get lost in the labyrinth of alleys in this area. This is my sixth passport and just my third time to travel with my new Irish passport issued in August. The features on this newly-designed passport include those opening lines from ‘The Lake Isle of Inisfree’ by William Butler Yeats, as well as excerpts from poems in Irish by Nuala Ní Dhommhnaill and in Ulster Scots, as well as the score of the National Anthem. 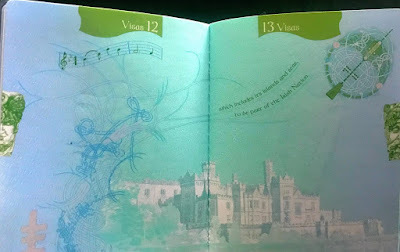 The new passport includes images of Irish landmarks and Irish scenery, including Croagh Patrick in Co Mayo, Kylemore Abbey, Co Galway, the Convention Centre in Dublin, the Samuel Beckett Bridge, the Rock of Cashel, Co Tipperary, the Cliffs of Moher in Co Clare, the Aviva Stadium at Lansdowne Road and Croke Park, as well depictions of Irish music and dance, Irish wildlife the Tara Brooch, the Book of Kells and Gaelic games – including the Sam Maguire Cup for football and the Liam McCarthy Cup for hurling – and horse racing. One nine-year-old born in Dublin has found in recent days that this does not apply to him, and faces deportation China, and perhaps 3,000 to 5,000 vulnerable children, who are undocumented or whose birth does not give them automatic Irish citizenship, may be facing the threat of deportation. I am thinking of their vulnerability and yet cherishing my own freedom to travel as I invite you to join me over these next few days as I travel freely through southern Spain and hopefully into Morocco in north Africa later this week and to share my experiences with me. 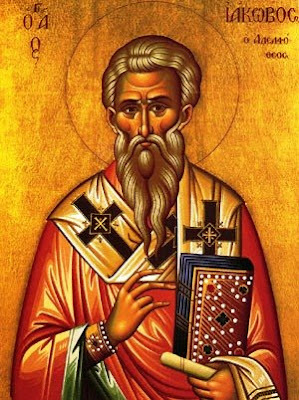 Today in the Church Calendar [23 October 2018] we commemorate one of the key figures in the New Testament, Saint James the Brother of the Lord, who is described in the New Testament as a ‘brother of the Lord’ and in the Liturgy of Saint James as ‘the brother of God’ (Iάκωβος ο Αδελφόθεος, Jácobos Adelphótheos). Some would say that James could have been a nephew of Joseph, that cousins could have been called ‘brothers’ and ‘sisters’ in the Aramaic spoken by Jesus, and that the Greek words adelphos and adelphe were not restricted to their literal meaning of a full brother or sister. 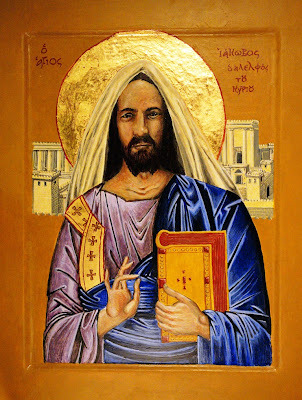 Whichever opinion you accept, this James is the James who is called James the Less (Mark 15: 4) to distinguish him from James, the son of Zebedee, who we encountered with John in our Gospel reading on Sunday last; or from James the Great, and who is also called James the Just because of his great holiness and righteousness. We identify today’s James with the author of the Epistle of James. The Apostle Paul names him as one of the witnesses to the Risen Christ (I Corinthians 15: 3–8), and describes James, alongside Peter and John, as a pillar of the early Church (Galatians 2: 9). The Letter of James, which we read in the Lectionary throughout the month of September, can be compared with some of the wonderful Wisdom Literature in the Hebrew Scriptures, with for example, its words of wisdom on true worship (James 1: 19-20), on discrimination and respect for the poor (2: 1-13), on the false dichotomy of faith and works (2: 14-26), on truth and careful speech (3: 1-12), godliness and worldliness (4: 1 to 5:6), on putting love at the heart of all relationships in the Christian community … and so on. They are words of wisdom that we can all take to heart in a community such as this. The speak of how we speak about one another, how we respect one another, how we hold up one another, how we love each other even in spite of our failings towards one another. We are to value one another, but not because of wealth or status or intellect; we are to listen to one another, and to be slow to speak and equally slow to anger; we are to bridle our tongues and not to speak loosely about one another. We are not just called to be Christians, but we must do Christianity too. When we have difficulties, are hurt or tugging against one another in any Christian community – whether it is here, in our families, in your future parishes or dioceses – then the words of James are a wise reminder of how we can how that our Christian faith is not just a matter of being but also doing. James was so important in the Early Church in Jerusalem that Eusebius describes him as the first Bishop of Jerusalem (Eccl. Hist., Book II: 23). But how important was James in the Early Church in Jerusalem? In the Acts of the Apostles, we read that when Peter escapes from prison and flees Jerusalem, he asks that James be informed (Acts 12: 17). Later, the Christians of Antioch ask whether Gentile Christians should be circumcised and send Paul and Barnabas to confer with the Church in Jerusalem (Acts 15: 12-22). James charts a middle course, supporting those who oppose demanding circumcision for Gentile converts but suggesting prohibitions against eating blood and against eating meat sacrificed to idols. When Saint Paul arrives in Jerusalem with the money he has raised for the Church there, he speaks to James, and James insists Paul should ritually cleanse himself at the Temple to prove his faith and to counter rumours of teaching rebellion against the Torah (Acts 21: 18ff). He was thrown from the wall of the Temple on the day of the Passover and was stoned. As he prayed for his slayers, his head was crushed by a wooden club wielded by a scribe. How many of us would like to die like this? How many of us would aspire to being pillars of the Church? How many of us would like to be so close to Christ that we could be called brothers or sisters of the Lord, still more ‘the brother of God’ (Iάκωβος ο Αδελφόθεος, Jákobos Adelphótheos). But to be a real brother of Christ, to be a real brother of God, is to be brothers and sisters to one another in Christ. This morning we give thanks for James who was an early disciple and apostle, a witness to the Resurrection, a reconciler and a mediator in the early Church, a pillar of the Church, a writer, the author of a New Testament epistle, an early martyr, and a wise counsellor. Readings: Isaiah 49: 1-6; Psalm 1; Acts 15: 12-22; Mark 3: 31-35.